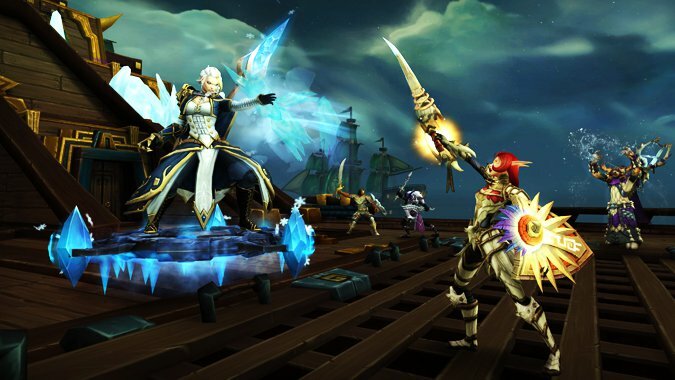 Blizzard has reverted an unintentional Battle for Azeroth hotfix that increased the difficulty of the Jaina Proudmore encounter in the Battle of Dazar’alor Raid. A new hotfix was rolled out the game’s live servers earlier today, and it seems that this new patch included a change to the Jaina encounter that wasn’t intended. Today’s Battle for Azeroth patch includes the Protection Paladins nerfs in PvP that we covered earlier, and changes to the Tal’Dagor dungeon and Stormwall Blockade boss encounter in the Battle of Dazar’alor raid. Additionally, the hotfix includes changes to Bwonsamdi’s Bargain and the Diamond-Laced Refracting Prism. • In Mythic Keystone dungeons, Explosives no longer gain bonus health from Fortified. -Fixed a cosmetic issue that caused several boats to unintentionally attempt to siege Zuldazar from underwater. -Fixed a line-of-sight issue that prevented players from damaging Laminaria as intended. -Increased Tidal Empowerment energy gain and Storm’s Empowerment energy gain to 3 per 3 seconds (was 2 per 3 seconds). -The absorb provided by Diamond-Laced Refracting Prism is now cleared at the start of an Arena or Battleground and is considered a Magic effect for dispels. -Bwonsamdi’s Bargain can no longer prevent death while participating in Arenas or Rated Battlegrounds. -Light of the Protector and Hand of the Protector’s healing reduced by 40% when engaged in combat with enemy players. -Mana regeneration reduced by 30% when engaged in combat with enemy players. • Guards who go hard at players in War Mode have been added to Terrace of the Devoted and Tortoka Refuge. World of Warcraft: Battle for Azeroth patch 8.1 ‘Tides of Vengeance’ is available now globally. Patch 8.1.5 ‘Crucible of Storms’ is currently live on the PTR.